"So Effective It Received USA Federal Funding!" "This class should be required of every married couple who hopes to have a happy and successful relationship" - Brian G.
"Thank you Rabbi – As always you come around and pick up our pieces – We were at the end of our marriage and you showed us it was only the beginning..."
You’ll discover the ideas you are actually using that is undermining your marriage and what to do to turn it around. Love is like a game. If you don’t know the rules, you won’t be able to win. I’ll show you what these rules are. Once you understand them, you’ll know exactly what’s going on in your relationship, so you both win. Just about everyone asks this question at some point in their marriage. You won't believe the answer until you hear it. Come hear why your spouse is perfect - it's an incredible experience. Being happily married isn’t rocket science. Humans have been doing it for a very long time. We are built to be married, and happily married. It's so easy, you already know how to do it. I’ll help you uncover the wisdom that’s already within you. Every relationship has give love needs. When you get and give them, you find happiness. They aren't strange nor exotic, rather they are simple and obvious. Once you both learn exactly what your marriage needs, you will be amazed how easy it is to make each other happy. You’ll discover how to argue and win every time. At home. At work. Everywhere. Every day. This highly charged session has it all. Everything you ever wanted to know about getting and having intimacy. Bonus: You'll also receive the 40+ Page Marriage ﻿﻿﻿Love-Book... The Marriage Personality System... To Start Using TODAY! 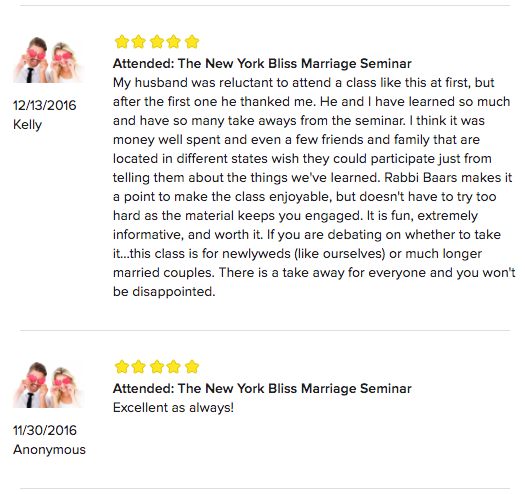 What Else Others Are Saying ﻿About﻿ The Bliss Marriage Seminar! Who Should Come to The 7-Week Bliss Marriage Seminar? We want to shoulder all the risk so if you don't love it or it doesn't work the way you want, just let us a know and you'll get a full refund. No other Marriage program or counselor offers this! Thanks for taking the time to read this. I look﻿ ﻿forward to seeing you at the seminar. 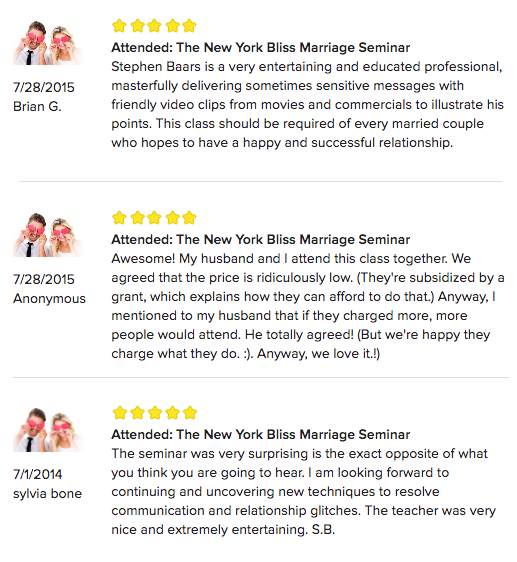 I'm inviting you to The 7-week, "Bliss Marriage" seminar for 68.5% OFF. This means you get 2 tickets to the 7-week marriage program for just $369. After you register, you'll get the bliss marriage system and personality test to use immediately. If you don't love any of the sessions or it doesn't change your marriage and relationship (even if it's years after the program), just let us know and you'll get a full refund. So, click the button below to get 2 tickets and take 68.5% OFF. This will be the best money spent on your relationship. 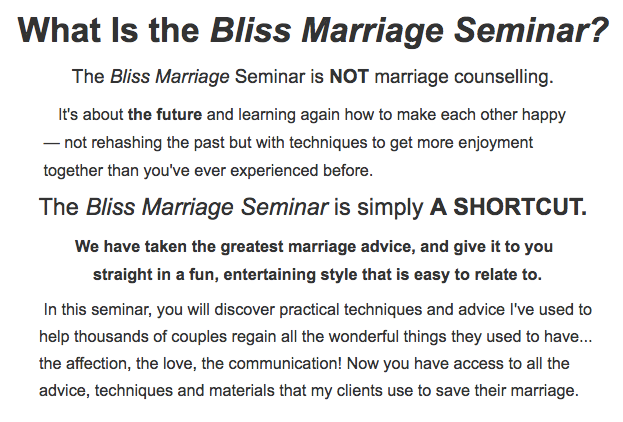 ➜ Register For the Bliss Marriage Seminar Now! 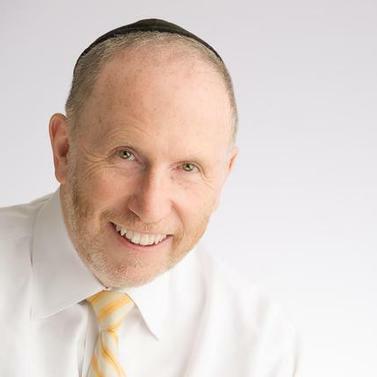 Rabbi Stephen Baars, creator of BLISS, has been a pre-eminent educator and marriage counselor for more than 30 years. He is known for his talent in imparting important ideas with creativity and humor, especially in the areas of marriage and parenting. Rabbi Baars has successfully counseled hundreds of couples, making marriage counseling his specialty. It was these counseling experiences, along with his extensive work motivating people that spurred him to begin the development of the BLISS seminar. BLISS is one of the many educational seminars he has authored. Others include Thrill and Think Like a Winner. He has authored a number of books including “Bliss” and “Win”. Born and educated in London, Rabbi Baars did nine years of post-graduate studies at the Aish HaTorah Rabbinical College in Jerusalem and studied comedy at UCLA with a well known comedian, Taylor Negron. Rabbi Baars and his wife, Ruth, are blessed with seven children.